At the halfway stage of the EuroCup Women eighth final, four of the lower seeded teams hold the advantage in the aggregate series. Defending champions Elitzur Ramla suffered their first defeat of the competition to Turkish club side Kayseri Kaskispor (69-79). Basket Landes had the largest crowd in the club for their match against Arras with 2400 people attending. Unfortunately for Basket Landes the game turned into a nightmare. Arras raced out to a 15-2 lead with just over four minutes and ended the first leg as a contest by the end of the first quarter with a (27-8) advantage. Basket Landes were without Jennifer Humphrey and just had one of those days when the ball refused to drop. They ended up losing (50-73). For Arras Gabriela Marginean and Pauline Akonga-N'Simba led the way with 23 and 22 points respectively. Elsewhere French teams opened the first leg with victories: USO Mondeville, playing at home, went into the second leg against Botas Sports club with an 11-point lead (69-58). Katerina Zohnová (15 points) and K. B. Sharp (13 points and 6 assists) needed the 45 seconds of magic by Ingrid Tanqueray at the end of the game to win by double digits. Tanqueray fired in two three-balls as well a a two-point jumper. Hainaut Basket can say that they were lucky to escape from Dexia Namur with the victory (69-63). Our colleagues from Basketfeminin.com in Belgium streamed the match live and are likely to put some highlights together on their site. We will be streaming the return leg live on our web TV page on 18 January 2012. Gran Canaria 2014 made home advantage count as they beat Besiktas JK (69-60). Once again the telepathic duo of Astou Ndour and Dandra Moss with a combined total of 35 points served the Spanish side. A 9-point lead will be hard to defend on the road against a team with Ebony Hoffman, Yasemin Horasan, Ilona Korstin and Candice Wiggins but the EuroCup Women is a competition that does not follow any logic. MBK Ruzomberok have had close games in this competition and they held off Optimum TED Ankara (71-65). However the team from Turkey who trailed by as many as 18 points should be able to make up the 6-point deficit at home. Dynamo Kursk have not lost a match in this competition and did not let their number one seeding worry them as they dispatched BC Horizont (82-52) to more or less book their ticket into the quarter-final. 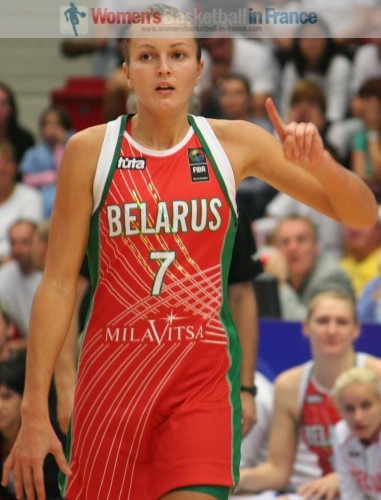 Belarus international Yuliya Rytsikava (formally known as Yuliya Dureika, in picture) led a balanced scoring attack with 14 points for Kurst. Last season Rytsikava played for BC Horizont. The Lotto Young Cats from Belgium had the best start possible against BC Chevakata with a (19-12) opening quarter lead. However the Russians blew them away in the second quarter (31-4) and then paced themselves to a comfortable victory (82-55).